To avoid clogging and dilating pores, skin care should be simple: a cleanser, a moisturizer, and a sunscreen are generally adequate for most skin types. Excessive washing, aggressive scrubbing, use of harsh chemicals, or layering numerous products can result in increased oil production and larger pore size. Choose facial products labeled as “non-comedogenic” – meaning they are specifically formulated not to clog pores. Avoid products based in oils, waxes, or shea butter. Any make-up should be cleansed before exercise or sleep. When the weather is hot and humid, skip thicker products that might cause occlusion of sweat glands. Retinoids are class of compounds derived from Vitamin A. They enhance cell turnover, bolster elasticity, prevent breakdown of collagen, and decrease oil production. This results in diminished pore size, improved skin texture, and fewer fine lines. For first timers, it is best to start with an over the counter retinol and build up to a prescription strength retinoid. Some dryness, redness, and peeling may occur but generally improve with time as the skin acclimates. Retinoids increase sun sensitivity so must always be used with sunscreen. Effects on pore size may take several months to appear. For a quicker fix, a Laser Genesis series is the perfect boost. It is non-ablative, non-invasive, and very comfortable. 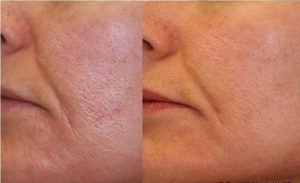 By gently heating the dermis, located just below the skin’s surface, Laser Genesis stimulates collagen production, smoothening the skin and decreasing the appearance of pores. The best part: it is a lunch-time laser with minimal downtime. Laser Genesis is a YAG laser, meaning it is safe in all skin types.